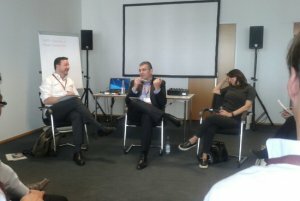 The GDL was strongly represented at this year’s 5th World Responsible Leaders Forum of the BMW Foundation Herbert Quandt. At the Open Space facilitated by Impact Hub, the Responsible Leaders were invited to collaborate around solutions and initiatives. Juliane Figale from the GDL Secretariat and GDL member Imran Simmins pitched for the Global Diplomacy Lab and discussed its concept with other participants. 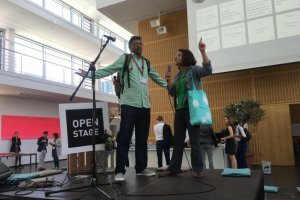 Session 12: Funding Mechanisms for NGOs in Transformation Countries – Curse or Blessing? Furthermore, GDL member Eirliani Abdul Rahman spoke at dinner to introduce the work and campaign of Nobel Peace Prize laureate Kailash Satyarthi. Juliana Figale is senior project manager at the Global Diplomacy Lab’s secretariat, which she has been co-creating since 2014. In her daily work, she is passionate about drawing up ideas and playing with diverse possibilities of implementation. She also greatly enjoys collaborating with a worldwide community of talented professionals from various sectors. Intercultural consensus-building particularly fascinates her – something she has gained from her Brazilian-German identity. Prior to the Global Diplomacy Lab, she worked for Training for International Diplomats of the Federal Foreign Office, conceptualizing and implementing the First Regional Meeting for the Americas and the Caribbean. Juliana completed her PhD coursework at the Philosophy, Art & Critical Thought division of the European Graduate School in Switzerland. Focusing on political philosophy, she writes about an ethics that is actualized in language and body. Juliana is an alumna of the Managing Global Governance Program of the German Development Institute and of the Federal Foreign Office’s Training for International Diplomats program. Before moving to Berlin in 2011, she completed an MA in Public Policy at the Getulio Vargas Foundation and a BA in Economics at the Federal University of Rio de Janeiro in Brazil. As a researcher at FGV, she advised, among others, the Brazilian Presidency and the Brazilian Ministry of Culture. She is co-founder of Saravia Institute, a Brazilian think-tank that works in the field of public policy and governance. Juliana is keen on discovering her surroundings by bike, on foot and in yoga positions, and she is intrigued by encounters with the uncanny where it appears too close to be witnessed. Amel Karboul is Secretary-General of the Maghreb Economic Forum (MEF) and Commissioner of the International Commission on Financing Global Education Opportunity. Amel is a social activist, entrepreneur, author and politician. She holds an honours Master’s in Mechanical Engineering from the Karlsruhe Institute of Technology (KIT), Germany, and a Doctorate in Coaching and Mentoring from Oxford Brookes University, UK. She has previously held leadership roles in DaimlerChrysler and senior consultant roles at the Boston Consulting Group (BCG). Visiting professor at DukeCE. She served as Minister of Tourism in the Tunisian transitional government until February 2015 and was nominated as one of ten leading young African politicians (Jeune Afrique).